At times mirroring and at times shockingly disparate to the rise of traditional white American medicine, the history of African-American health care is a story of traditional healers; root doctors; granny midwives; underappreciated and overworked African-American physicians; scrupulous and unscrupulous white doctors and scientists; governmental support and neglect; epidemics; and poverty. Virtually every part of this story revolves around race. 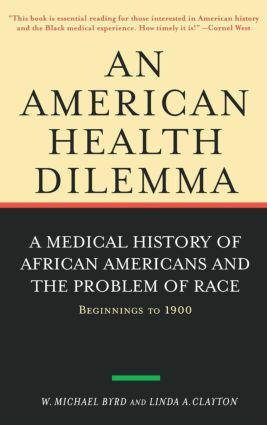 More than 50 years after the publication of An American Dilemma, Gunnar Myrdal's 1944 classic about race relations in the USA, An American Health Dilemma presents a comprehensive and groundbreaking history and social analysis of race, race relations and the African-American medical and public health experience. Beginning with the origins of western medicine and science in Egypt, Greece and Rome the authors explore the relationship between race, medicine, and health care from the precursors of American science and medicine through the days of the slave trade with the harrowing middle passage and equally deadly breaking-in period through the Civil War and the gains of reconstruction and the reversals caused by Jim Crow laws. It offers an extensive examination of the history of intellectual and scientific racism that evolved to give sanction to the mistreatment, medical abuse, and neglect of African Americans and other non-white people. Also included are biographical portraits of black medical pioneers like James McCune Smith, the first African American to earn a degree from a European university, and anecdotal vignettes,like the tragic story of "the Hottentot Venus", which illustrate larger themes. An American Health Dilemma promises to become an irreplaceable and essential look at African-American and medical history and will provide an invaluable baseline for future exploration of race and racism in the American health system.